Fire Extinguisher ball is a kind of shaped ball extinguisher. When simply thrown into the fire, it would activate within 3 seconds and effectively disperse extinguishing chemicals. There is no special train or skill required to operate the ball and no need to face any dangers. No inspection and maintenance are required for the product life span for 5 years. 1. Light weight only 1.3 kilograms, shape of a ball even the old and children can use it easily. 2. As long as simply roll out to fire scenes or set in the places easy on fire, such as the electric case, the gas barrel, flammable chemical articles in the factory, shopping mall, gas station, hotel, or even in the car. 3. As long as been touched for 3-5 seconds by flame reaching 70 degree C, A.B.C will automatically extinguish the fire effectively and rapidly. 4. You don&apos;t need to be close to fire scenes to extinguish the fire any more . A.B.C is made of totally harmless material to the environment and safe for users: the exploding power has been accurately calculated to be approved safe. 5. It can be always at your service to extinguish the fire and no need to do regular inspection yearly. The product life span is 5 years, and the decibel when extinguishing the fire can be a fire alarm to warn people in the fire scenes. 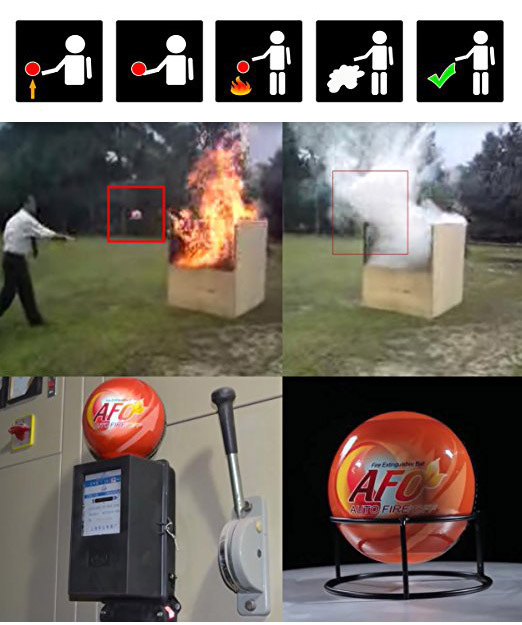 (Active Use) Throwing Fire Extinguishing Ball into the fire - When a fire occurred, take the nearest available Fire Extinguishing Ball and simply throw it into the fire. The ball will naturally fall into the base of the flame, where it is most needed, and activate within 3 seconds. No need to get close to the fire. No special training or skills required. 1. 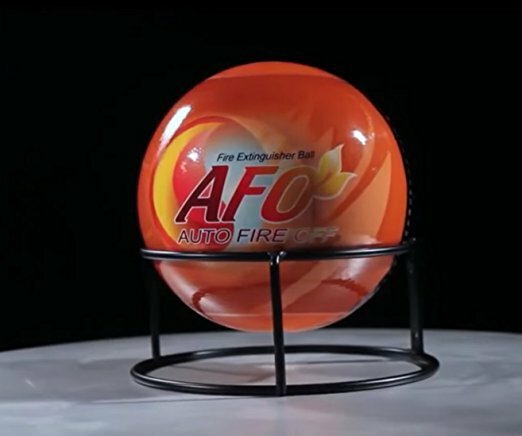 Fire Extinguisher Ball can be placed on a shelf top, tabletop, along the hallway or any visible area of easy access. 2. Fire Extinguisher Ball is best mounted in high risk area such as kitchens, electrical circuit breakers, overloaded electrical outlets, or near fire places. 1. Light weight - Only 1.3 kg, children and elderly people can use it easily. 2. Easy use - Just throw it into the fire or install it in any fire risk areas. 4. Safe to use - No need to get close to the fire. 5. Non-toxic to the environment - Fire Extinguisher Ball is made from human and environmental friendly materials.